Hope everyone’s enjoying the weekend. I am back on Weight Watchers tracking everything I eat (I go back to tracking anytime I need to lose a few pounds, like after a vacation or the holidays) and I’ve been sharing my daily routing on Instagram stories, if you are interested you can follow along, here is my Instagram. It’s also a year since my Dad passed, so it’s fitting to add his Czech Crepes with Berries and Cream to the meal plan this week, I grew up making them with my Dad. I just finished Day 1 of this week’s plan and let me just say that it was DELICIOUS. I can’t wait to have the mac & cheese leftovers for lunch tomorrow! Please please please keep doing these plans! I’m only one day in, but I’m already SUCH a huge fan!! I’m only cooking for 2, so the serving sizes are perfect with all of the leftovers we can share. I cannot express just how grateful I am that you put in the work to set this up for us! For FREE! Thank you so much!! Please, please, PLEASE keep doing these! I have just been turned on to your site, and i LOVE how you work. You make enough for leftovers, have a grocery list set up, and even have that list organized into sections for easy shopping. Please, do not stop doing these meal plans! Although I’ve used a few of your recipes, I plan on trying a meal plan next week! I was a diabetic, and am a bariatric patient so these plans help A LOT for new and inventive ways to eat healthy. Love your meal plans! They make following WW so much easier and less boring. Please keep sharing them. Excited to start using your meal plans! do have one quesrion though. If breakfast and lunch is designed for one person does the grocery list need to be adjusted to add for additional ingredients? I want to tell you Thank You! I have found that I love your healthier versions of some of the foods I love. I also like the new things that I haven’t tried too. I bought your cookbooks and have been meal planning off of them. I brought my teen girls into the kitchen with me to make these meals. It has been bringing us closer. It also makes the girls like the healthier meals because they are helping put it all together. I just found your website, and your meal plans. Wow this is so perfect. It makes our whole process simpler. The grocery list too!!! Thank you for all of your time and care. We feel it in our home. Your site and meal plans are extremely popular at the tech company where I work. I’m very grateful to them for recommending skinnytaste. It’s become our family’s go-to site for meal plans, grocery lists, and recipes. Please keep sharing and thank you for all you do!! LOVE your meal plans. They make my life SO much easier – I would be lost without them. Thank you so much for taking the time to make them and to share them!!! Absolutely love this site and the meal plans. Thank you!! These meal plans continue to save my sanity every week! Thank you!!! Please keep sharing! 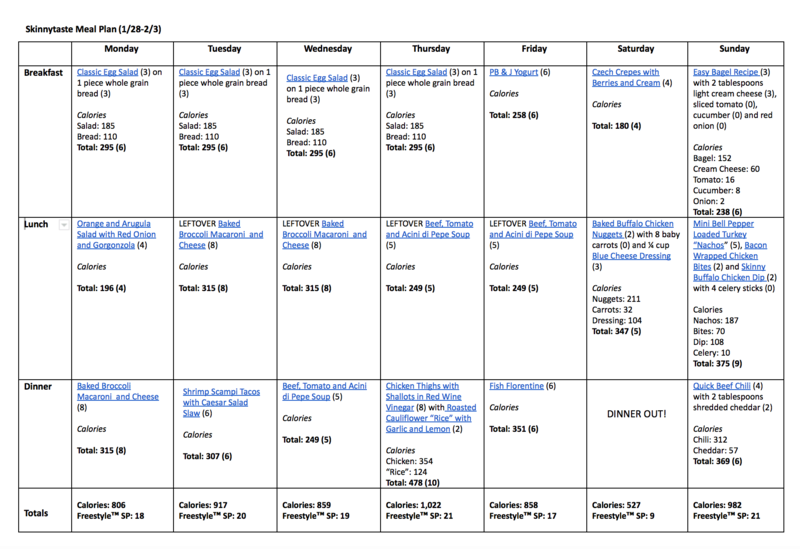 Your meal plans make my life so much easier! Thank you for all your hard work and inspiring words. The meal plans are amazing! Thank you for adding “game food” for the Super Bowl inn sunday!!! Gina, I love these plans. Even if I don’t follow it exactly, it’s a great way to see recipes I missed. Thank you for posting these meal plans! My family has been using them and it’s really helpful! We always struggle with what to make and end up repeating a lot of meals. This makes planning so much easier and we look forward to trying new recipes. Pretty please keep doing the weekly plans. I just discovered them last week and I’m hooked! Thank you so much for offering them. I love these weekly menus. Easy. Tasty. Easy on the pocketbook. I’m absolutely thrilled. I am sooo happy to have found these weekly meal plans!!!! Just what a busy working mom needs to help plan to stay on track! Thank you for sharing these. I have found them very useful and have even been coordinating with my mom and sister how to follow these together as they use them too. It’s such a great way to stay on track. Hoping you will continue to share these. Please continue to post weekly meal plans – these help my family and I so much and is a mindless way to help stay on track!! I love love love that you have stuff to eat on Superbowl Sunday! how fun! Thank you so much for these plans! I check them out every Sunday! They are so helpful for fresh, new ideas and my family enjoys so many of your recipes. Love this week’s meal plan. Thank you!! I love your plans! Please keep making them. The way everything is so clearly laid out is perfect. I can go to the grocery store (or better yet do my clicklist and pickup!) so easily and I love knowing what to eat each day. Please keep them coming! 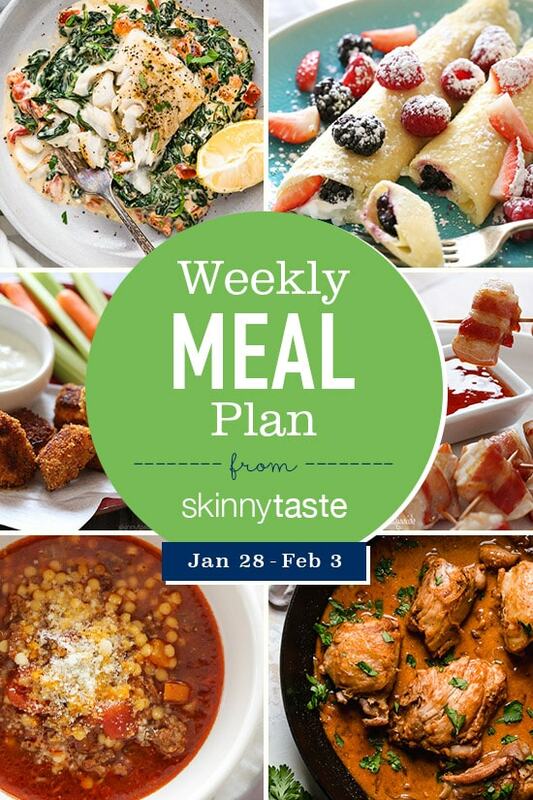 I love your meal plans !- the recipes are wonderful, everyone in my family loves them! I love the flexibility and the grocery lists. Saves me time and money! Please continue to share! Thank you for sharing your meal plan AND shopping list. Just shaved hours off of my week! Cant wait to put these meal plans in motion!!! These plans are a lifesaver. Great for meeting the desires of a family while allowing me to stay on a healthy weight loss track! The recipes are always crowd pleasing! Don’t ever stop providing these. Don’t stop doing the meal planner! I love them! It’s too much for me to try to figure out a meal plan on my own being a working mother with three kids. This is saving me from my food rut. The grocery list is so helpful, too. I”m heading to Wegmans right now with printed list in hand! Love the meal plans! All of your recipes are wonderful!! Yep, I enjoy using them too! Please continue to post meal plans, recipes and shopping lists. I’m grateful for your effort to assist us all in slimming down! Thank you so much for sharing these plans! YES! I am using them! It has gotten back on to a good routine of meal planning for the week which saves me so much time DURING the week since I no longer have to hunt for recipes each day. It also keeps me from making those unhealthy eating choices I make when I don’t have a plan. Thank you. Please please keep sharing.